We're accuracy and precision specialists. Let us assist you with your calibration needs. Our laboratory utilizes state-of-the-art technologies to reduce the effect of vibrations on calibration. Environmental controls are closely monitored to ensure that laboratory temperatures are consistently optimal. Our scales are routinely calibrated and inspected by third party specialists. We specially train, test, and certify our technicians so that they follow strict operating procedures. We inspect each channel of multichannel pipettes. For all pipettes, in addition to calibration tests and leakage tests, we'll make the necessary adjustments (seal and o-ring replacement, battery replacement, complete reassembly, piston cleaning) to ensure that you get your pipettes back within tolerance limits. Calibration data collected before and after technical adjustments will be provided to you in the form of Certificates of Calibration upon return of your pipettes. We offer a pickup service with fast turnaround time for labs located in Northern California. Customers in other parts of the country can take advantage of our mail-in service. On-site servicing can be arranged. Please contact us for more information about on-location calibration. We offer three calibration solutions. Choose the one that best fits your needs. 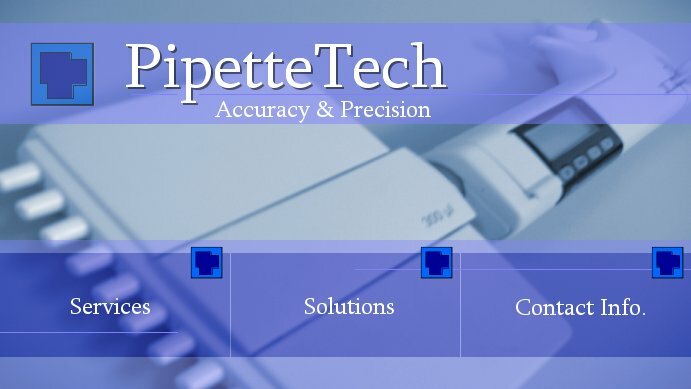 Getting your pipettes calibrated couldn't be any easier. Our friendly staff will drop by your lab and pick up your pipettes. After the pipettes are inspected and calibrated by our certified technicians, we'll deliver them back to you within tolerance limits. Estimates will be provided for pipettes that require repair. Our turnaround time is fast. When your pipettes are due for calibration, we'll send you a reminder. We can place your pipettes on different calibration cycles. Remote customers can take advantage of our mail-in service. Mail your pipettes to us and we'll send them back to you calibrated and within tolerance limits. The turnaround time for this service is fast. Reminders are sent to you when your pipettes are due for calibration, based on the calibration cycle of your pipettes. Depending on your location, you may be able to take advantage of our on-site solution. We'll send our technicians to you to perform on-location calibrations. This service offers the fastest turnaround time. Please contact us for more details about on-site calibration. For more information about our calibration services, please send us an email. Alternatively, you can give us a call at 510-264-0964. Copyright © 2006, PipetteTech Calibration Company. All rights reserved.